A high-protein diet, protein shakes, bars, and chips are all typically stereotyped as being something for young, testosterone-raging men packed inside the gym or sports field. And, to an extent, it makes sense, since a high-protein diet is very important for muscle size, strength, and maintenance. But, a high-protein diet isn’t just for athletes or people looking to get a little bigger, stronger, or leaner. High-protein diets have substantial health benefits for everyone, particularly those who are 60-plus or just looking to improve overall health. In fact, if you’re looking for a relatively easy way to feel better, lose some weight, get stronger, stop mindless snacking, and protect yourself from injury, a high-protein diet might be the best thing you can do. Protein is one of the three macronutrients (the others are carbohydrates and fats) that make up your diet. Although you can find it in high concentrations in animal products like chicken, beef, turkey, eggs, and dairy, there is protein in plant products, too. Even broccoli has a bit of protein, as do nuts. As far as plant products go, the best protein servings come by way of the legume family. Proteins consist of smaller compounds called amino acids, and there are 13 of them. Animal sources contain all 13 amino acids and are called “whole” or “complete proteins.” Plant sources, however, do not have all the amino acids and are therefore known as “incomplete proteins.” To make complete proteins from plant sources, you need to mix and match them. Once all the amino acids form the proteins, they go to work in your body. Protein helps build and repair tissue, rebuilds and maintains muscle, and improves body composition and strength. In addition to those physical benefits, a high-protein diet can also help curb appetite by increasing satiety by keeping you fuller longer. Research shows that adding more protein to your current diet can cut as many as 400 calories out per day because of its high satiety. Protein also helps burn extra calories because of its high thermic effect, which allows the body to break down and absorb nutrients. A high-protein diet can improve mobility by increasing strength and muscle mass, as well as help maintain strong bones. A high-protein diet is one that comes out to about one gram of protein per pound of bodyweight, but it depends on your activity levels. People who have an interest in building muscle or strength training and have a very active lifestyle (e.g., weight training and CrossFit), may want to intake 1.2 or 1.6 grams of protein per pound. Serious lifters can intake as high as two grams per pound of bodyweight. At the very least, a high-protein diet would provide one gram per pound of bodyweight. That’s higher than the American RDA, which recommends about 56 grams per day for sedentary men and 46 grams for sedentary women. And, quite honestly, this is not a very good recommendation. There is plenty of research supporting the health benefits of a high-protein diet. Protein contains four calories for every gram. One gram of carbohydrate also contains four calories, while a gram of fat has nine. And, if you’re interested to know, alcohol has seven calories per gram. So, let’s say you’re 160 pounds and you want to go on a high-protein diet. Your maintenance calories are about 2,400 per day. A total of 160 grams of protein would come out to 640 calories per day, or about a quarter of your daily calories. The more active you are, the more protein you’ll consume, so this will reduce the number of calories consumed through fat and carbohydrates. Ideally, you should spread your protein intake throughout the day instead of having one large serving in one meal as most Americans do. In using the 160-pound example, you could have four servings of 40 grams, five servings of 32 grams, or however you’d like to distribute your meals and snacks over the course of the day. Eating about 40 grams of protein for breakfast is shown to limit appetite and regulate hunger hormones throughout the day. An easy way to hit your targets is to eat eggs and egg whites at breakfast, have meat or fish at lunch and dinner, and snack on items like nuts, legumes, yogurt, and protein shakes during the day. A high-protein diet is healthy for everybody, especially those at an advanced age because it helps retain strength and muscle mass. As we age, we lose muscle mass naturally, and this is because of years of stress on the body, lower levels of activity, lower protein consumption, and genetics. So, older people need more protein than in their earlier years. Sarcopenia (the condition of muscle loss) is what’s known as a silent epidemic. Less muscle leads to poorer balance, less agility, less padding and protection for the bones, and a much lower quality of life. Protein and muscle mass can protect the bones from damage and breaks, as well as reduce the risk of osteoporosis and any pain associated with it. If you’re eating more protein, it’s likely you’ll be eating less of the stuff linked to chronic illnesses like type 2 diabetes and cardiovascular disease. As mentioned, protein in the morning can regulate hunger hormones, diminishing cravings for starchy, sugary, and fatty foods throughout the day. By increasing satiety in general, consuming protein throughout the day can limit appetite and the likelihood of unhealthy snacking. With unhealthy food choices being a major contributor to high blood pressure, high cholesterol, atherosclerosis, heart disease, and type-2 diabetes, a high-protein diet can help thwart these risks. A high-protein diet is also central in the battle against sarcopenia and osteoporosis. As mentioned, protein helps build and maintain muscle to limit muscle loss and provide protection for your bones. Muscle takes stress off the bones, which allows for greater resiliency and some buffer against bumps. Can a High-Protein Diet Make You Sick? There are people who claim high-protein diets can be bad for your kidneys and liver, as well as increase the risk of cardiovascular disease. And, although these folks aren’t entirely wrong, they often fail to mention the specific conditions affecting a person that may increase the likelihood of such issues. In most people, a high-protein diet is safe and healthy. And here, it’s important to point out that a high-protein diet is not an all-protein diet, and there is still plenty of room to add healthy foods like whole grains, fruits, vegetables, and healthy fats. However, for people with kidney disease, going on a high-protein diet may present some risks and should, therefore, be avoided. If you have kidney disease, it may be worthwhile to opt for a moderate-protein diet, but you should discuss all measures with your doctor. As far as heart disease goes, protein intake will not directly lead to an increased risk, but rather the protein choices you make might have some impact. For example, ground beef and other fatty red meats are very high in calories. Therefore, if some of your regular protein choices are fattier options like ground beef, bacon, and fatty cuts of steak, you’re also getting a lot of fat. And, at the end of the day, if you’re consuming more than your maintenance calories every day, you’re also going to put on weight, which can lead to increased blood pressure and the risk of heart attack or heart disease. To get the most out of your protein, selecting the leanest sources is typically best. Doing this allows you to save your fat calories for super-healthy sources like avocado, olive oil, almonds, walnuts, peanuts, nut butters, and more. If you do select fattier protein options, we highly recommend you choose fish so that you can take advantage of the omega-3 fatty acids exclusive to this food source. 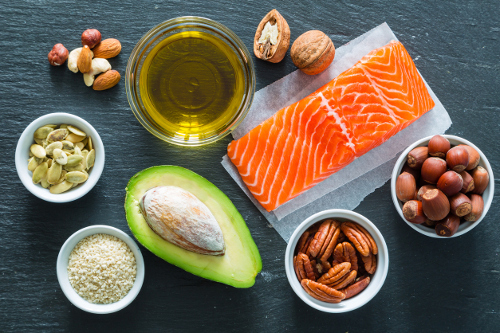 Omega-3s have many health benefits including lower blood pressure, a decreased risk of dementia and Alzheimer’s disease, and improved cardiovascular function. Game meats like bison, wild boar, elk, etc. You may have noticed that most of the sources come from animals, and as mentioned earlier, this is because animal sources offer complete proteins. So, although you can get protein from a variety of plant sources, you’d have to eat much more every day, and it would be far more difficult to achieve the benefits of a high-protein diet. These days, it’s extremely easy to keep track of your protein intake and know exactly how much you’re getting per serving of food. If you have a smartphone, you can use an app like “My Fitness Pal” that offers a gigantic database of food and can keep daily records of your total caloric and macronutrient intake. It’s highly recommended for anybody interested in seeing what they eat every day, and is a very effective weight loss or weight management aid. Just ensure you make the appropriate adjustments based on serving size. If you’re not into apps, you can also do a quick Google search to determine the macronutrient and calorie content of every food on earth, so that’s an easy way to keep track, too. And, if you want to do things the old-fashioned way, you can sit down with your calculator and reading glasses and go through food labels! To get all your information right, we recommend using a scale because you have to get the serving sizes properly calculated. A high-protein diet is healthy and a good diet model for everybody, not just weightlifters. It’s valuable for people young and old, male and female, athletic or not. However, to get the most benefit from your high-protein diet, resistance training is highly recommended, but not required. Pesta, D. H., et al., “A high-protein diet for reducing body fat: mechanisms and possible caveats,” Nutrition and Metabolism, November 19, 2014; 11(1): 53. doi: 10.1186/1743-7075-11-53. Morales, F. E., et al., “Acute and Long-Term Impact of High-Protein Diets on Endocrine and Metabolic Function, Body Composition, and Exercise-Induced Adaptations,” Journal of the American College of Nutrition, April 26, 2017; 1-11. doi: 10.1080/07315724.2016.1274691. Leidy, H. J., “Beneficial effects of a higher-protein breakfast on the appetitive, hormonal, and neural signals controlling energy intake regulation in overweight/obese, “breakfast-skipping,” late-adolescent girls,” The American Journal of Clinical Nutrition, April 2013; 97(4): 677–688. doi: 10.3945/ajcn.112.053116. Bonjour, J. P., “Protein intake and bone health,” Internation Journal of Vitamin and Nutrition Research, March 2011; 81(2-3): 134-42. doi: 10.1024/0300-9831/a000063. Paddon-Jones, D., et al., “Role of dietary protein in the sarcopenia of aging,” The American Journal of Clinical Nutrition, May 2008; 87(5): 1562S-1566S; http://ajcn.nutrition.org/content/87/5/1562S.full, last accessed April 28, 2017. Paddon-Jones, D., “Dietary protein recommendations and the prevention of sarcopenia,” Current Opinion in Clinical Nutrition and Metabolic Care, January 2009; 12(1): 86–90. doi: 10.1097/MCO.0b013e32831cef8b. Gannon, M. C., “Effect of a High-Protein, Low-Carbohydrate Diet on Blood Glucose Control in People With Type 2 Diabetes,” Diabetes, September 2004; 53(9): 2375-2382. https://www.ncbi.nlm.nih.gov/pubmed/15331548. Zeratsky, K., “Are high-protein diets safe for weight loss?” Mayo Clinic, March 26, 2015; http://www.mayoclinic.org/healthy-lifestyle/nutrition-and-healthy-eating/expert-answers/high-protein-diets/faq-20058207, last accessed April 28, 2017. Weigle, D. S., et al., “A high-protein diet induces sustained reductions in appetite, ad libitum caloric intake, and body weight despite compensatory changes in diurnal plasma leptin and ghrelin concentrations,” The American Journal of Clinical Nutrition, July 2005; 82(1): 41-48; http://ajcn.nutrition.org/content/82/1/41.abstract, last accessed April 28, 2017.